The Small Arms Survey, a Geneva-based research institute, has released a new publication authored by ARES Director N.R. Jenzen-Jones, with contributions from ARES staff members Jonathan Ferguson and Graeme Rice. Research Note 48: Automatic Grenade Launchers looks at the technical features, development history, and usage of this light weapon system. 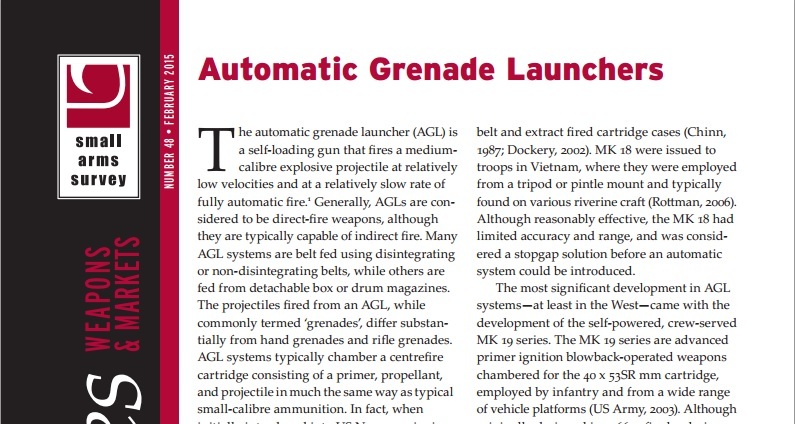 The automatic grenade launcher (AGL), which launches a medium-calibre explosive projectile at relatively low velocities on automatic fire, is common in military inventories worldwide. In addition to legitimate military forces, AGL systems have been documented in service with numerous non-state armed groups, including groups in Chad, Iraq, Libya, Somalia, South Sudan, Sudan, Syria, and Ukraine. The projectiles fired from an AGL, while commonly termed ‘grenades’, differ substantially from hand grenades and rifle grenades. AGL systems typically chamber a centrefire cartridge consisting of a primer, propellant, and projectile in much the same way as typical small-calibre ammunition. In fact, when initially introduced into US Navy service in the 1960s, AGLs were referred to as ‘40 mm machine guns’.Currently they are variously referred to as ‘automatic grenade launchers’, ‘grenade machine guns’ (GMG), and ‘grenade launcher machine guns’. The most significant development in AGL systems—at least in the West—came with the development of the self-powered, crew-served MK 19 series. The MK 19 series are advanced primer ignition blowback-operated weapons chambered for the 40 x 53SR mm cartridge, employed by infantry and from a wide range of vehicle platforms (US Army, 2003). Although originally designed in 1966, a final redesign in 1976 led to the MK 19 Mod 3, which first entered US Navy service, and then US Army service in 1983. The MK 19 has seen considerable export success and is in service with armed forces around the world. er mission endurance or reduced carry load). To read the full text of Research Note 48, click here. For other research by ARES on automatic grenade launcher (AGL) systems, you can find Arms & Munition Brief 1, focusing on the Chinese QLZ87 AGL and other related systems. 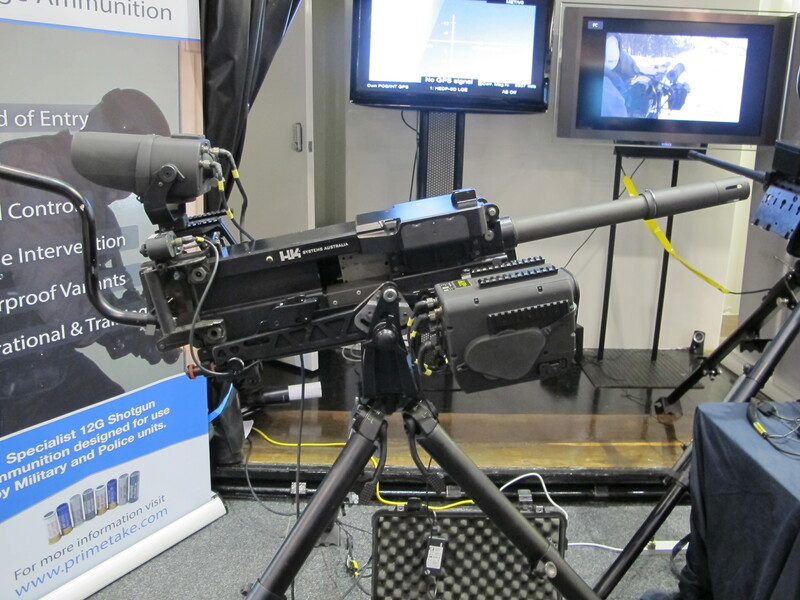 Heckler & Koch (HK) GMG E with Vinghøg Vingmate FCS and Softmount Combi at Land Warfare Conference, in Melbourne 2012.